Visitor management system is the solution that provides the better control of the movement of the visitor in the office premises. It also delivers the touch screen experience to the visitors. It is software that is used to keep the records, monitors, captures and recovers the customer information. The various features associated with the visitor management are auto-identification of frequent visitors and fingerprint scanning. It generates the access cards with authorized access based on the type of the visitor. This software enables the visitors to self-register and delivers the notification to employees. It eliminates the human errors and ensures high level of the performance and security of the employees in the premises. The global visitor management system market is anticipated to expand at a CAGR around 15.5 % during 2018-2027. It is anticipated to reach around USD 7.0 billion market size by 2027. This is attributed to the increasing demand for enhancing the safety and security by keeping the record of the visitors coupled with the increasing need for improving the administrative work. The global visitor management system market can be segmented on the basis of product, services, application, end-user and region. On the basis of product, it is sub-segmented into provisioning software, physical security information management and physical identity and access management. Physical security information management is anticipated to register highest CAGR during the forecast period. The various qualities of physical security information such as data analysis, data collection, resolution, data verification, reporting, and audit trail is anticipated to major reason for the growth of the physical security information sub-segment. On the basis of the service, it is sub-segmented into managed services, professional services and deployment & integration. On the basis of the application, it is sub-segmented into public safety & security, critical infrastructure protection, port security and energy security. On the basis of end-user, it is sub-segmented into healthcare & life sciences, BFSI, retail, it & telecom, aerospace & defense, government, education and others. The increasing adoption of the software based security options in order to address the various insurance and compliance issues is anticipated to be the primary growth driver for the global visitor management system market during the forecast period. Additionally, the increasing adoption of the paper-less administrative work by the various organizations is also driving the global visitor management system market. The increasing preference for the development of the services which include self-sign in and pre-registration facilities is increasing the demand for the visitor management system. 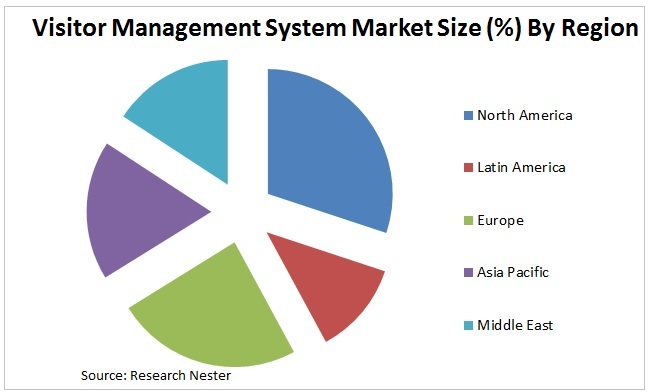 However, less awareness about the visitor management system is expected to hinder the growth of the global visitor management system market during the forecast period.